Customer service great. Very close to everything in Big sky. The view is awesome. Enjoyed our trip to Bozeman! Beautiful place --- very nice accommodations! We went to the Soul 2 Soul Tim and Faith concert last week! WooHoo! It is a beautiful house and very nice to have the freedom and comfort. Great place to stay in town. Really wonderful to be able to walk to dinner or do a little late day shopping. We went to our son's graduation and it was a wonderful long weekend. Thank you. Great place to stay in town. Really wonderful to be able to walk to dinner or do a little late day shopping. We went to our son's graduation and it was a wonderful long weekend. Thank you! The Fischers! So perfect for our group! We had a group of 14 and the house accommodated all of us. 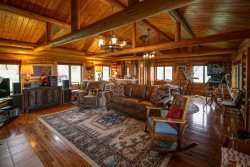 We skied at Bridger Bowl, the location of this house was perfect for us, it was only about a 25 minute drive across Brackett creek road. The kitchen/living room area is beautiful! The kitchen is a cooks dream! It is well stocked with all the necessities that we needed. We never ate out once. The property manager was very responsive and helpful. We WILL be renting this house again! The house was walking distance to downtown and to MSU. Very well put together. Catherine was very communicative. I would stay here again. The property, is nestled in an area of breathtaking views. The overall accommodations were outstanding. A few minor hiccups, overall; a beautiful lodge! The condo itself was great. Garage included, so we never had to scrape the car off. Nice kitchen. 5 min to town center and 10 min to the mountain. Very clean and everything worked. The king bed in the master was one of the best beds I've ever slept on. Each bedroom has its own bath. Very nice shower in master bath. Worked great for everyone. The Murphy bed in the second bedroom is on the firm side. Could use a pillow topper. Very nicely furnished. Good communication from property manager. Everything went smoothly. The daily rate for wifi usage is ridiculous, so we used our data plans. My only other gripe would be with the pricing structure. In the end, with the cleaning fee, insurance, and taxes, the effective nightly rate was almost double the advertised rate. That being said, I still plan to stay either at this particular place or something similar again, because it was still a much better deal than any of the hotel or resort properties in the area. Great place! Comfortable and fun layout...easy walk to town. We loved the condo! Had a beautiful view of the snowy woods from the upstairs porch. Nicely decorated and very cozy! The kitchen was well furnished (could use a few more kitchen towels) and bathrooms and bedrooms were well stocked with towels and blankets. The fireplace was used daily! Thank you for the supply of firewood! We had some issues with having enough hot water for showers. We got some help from property manager, but still think the water heater needs tweaking. There is no wi-fi here, which can be a plus or a minus. Also TV channels are very limited. There is no convenient shuttle to the Big Sky Ski Resort in Hidden Village so a rental car is a must if you don't plan on driving here. We enjoyed the walk to town center, but any sidewalks were buried under the snow so you are walking along the road. Trash disposal required a walk up the hill to the community center. Overall, the plusses outweigh the minuses! We had a lovely family vacation and treasured preparing and enjoying meals in the beautiful kitchen and dining room. Down time was spent enjoying the fire, playing cards or putting together a puzzle. Can't wait to visit during the summer months! I was part of a family of 4 with 10 children ages 10-21. We rented this lodge ( both buildings) over Christmas 2016. It was perfect! The lodge is big enough that we had plenty of room to spread out and yet cozy and comfortable. The kitchen was huge with two large refrigerators.It was easy to prepare meals for a party this large and with two large sinks and dishwashers clean up was a breeze too. The sleeping quarters are bunks and very comfortable. The bathrooms and showers are clean and modern! The views from the large windows are beautiful and while we didn't have any issues during our stay, the owners were responsive and easy to work with leading up to the rental. There is no wifi which, with kids, is not really a bad thing but signal strength was fine for keeping in touch, checking email, weather, etc. We had a great time! We rented snow machines for a couple of days. There are trails nearby for snow shoeing and cross country skiing. Bridger Bowl ski lodge is about a 30 dive away and a bunch of us went skiing one day. The lodge was a great fit for our group. Instead of splitting up for the night and driving to separate homes we were able to be under one roof. It really helped maximize our time. We really enjoyed our stay and we are looking forward to doing it again next year. The condo was perfect for us. We were very comfortable here. We left on Christmas Eve and went back to Helen for Christmas since the grand children had to split time between their dad and mom. Beautiful flat. Fun with family. DOMINOS was a hit! Thanks for the memories. We had a great stay in Bozeman. Can't beat the location here - Perfect! We'll be back again. Location location location!! Perfect vacation home!! This beautiful mountain home had it all. We took our two young grandchildren, ages 8 & 10, on a summer adventure. The house was the perfect setting for the combination of our hiking (right out the front door! We saw a moose! ), walking along the creeks below, quaint shopping and dining (the Big Sky meadows, just a short five minute drive), adventures at Big Sky Mountain (ten minute drive?) along with our need for relaxation. The kitchen is gorgeous and fully equipped to make your meals, we had a continuing project of jigsaw puzzles on the massive log dining room table. The kids enjoyed the solid log bunk beds and their own bathroom. The master bed/bath combo is just lovely. I loved starting my mornings with coffee and sunshine in the great room. The kids loved ending the day with a dip in the hot tub just outside the door. We will be back next year!! Catherine's home was just lovely and ideal for our long weekend in Bozeman. It is in a great location, check in and out was a breeze. We enjoyed the outdoor spaces very much and the master bedroom was so lovely with the cupola for fresh evening air. I highly recommend Catherine's lovely home. Very helpful, friendly, and efficient! This is a great place to stay in Big Sky! Condo was very comfortable with great kitchen and bathrooms - love the shower! Floor plan works well and BR locations provides privacy for multiple guests. Very quiet neighborhood to enjoy the natural surroundings. Amenities were great. Conveniently located - less than 5 minutes to Town Center shops and restaurants and less than 10 minutes to Big Sky Resort Base Camp - made this a great central location for my activities. Would definitely recommend and stay here again! This house is amazing, and Catherine was very flexible and accommodating. The kitchen is very well appointed and a great place to feed groups from and to use day-to-day for the long term. The house is a gorgeously redone old home with great amenities, beautiful art work, good layout, and nice furnishings. It's the type of place you want to entertain in so you can show it off! The back yard and deck are perfectly gorgeous and wonderful places to hang out in during the summer (deck is nicely shaded for the hottest days. We regularly walked into downtown, up the street to the Co Op for food or grocieries, or down the street to the dog park, play ground (at the school) and tacos (Tacos Montes), sandwiches, and ice cream (the Pickle Barrel). Many tasty restaurants nearby (South 9th Bistro, Saffron Table, La Parrilla, Roost, Feed Cafe, etc.). We can't wait to stay here again in the future! To the Heffner Family, My husband an i chose to celebrate our 50th anniversary here in Bozeman with our son, daughter, their spouses and 5 grandchildren. We so enjoyed your wonderful property. Went to Museum of the Rockies, an all day trip around Yellowstone with mike Sweeney, a super guide full of information and a Montana Whitewater rafting trip down the Gallatin River - all had a good time. This morning we walked out of the carriage house and saw 5 bucks together nibbling grass. We have seen lots of deer here and at home but have never before seen 5 bucks together, no one fighting for his territory. Just amazing! Sincere Thanks, The Schuick Family. I have known Chris Torsleff for four years as the GM in Breckenridge, where I stay at least four times a ski season. Chris has been amazing all this time, and I am not an easy customer (read difficult). He has been quick to help in any way he can, solving problems efficiently , anticipating needs and generally providing services above and beyond what was in his purview as general manager. I will miss Chris and his cheerful demeanor, he was a good part of the reason I made Breckenridge my regular "home" for all my trips. Nice as always, home away from home for us. See you next time.